COTTON BAG FOR POT-POURRI. CLOSING IN SATIN. PRINTING IN FOUR OF 'PICTURE REPRESENTING SAN PIO AND HIS THOUGHT. BAG IN COTTON POLKA DOT FOR POT-POURRI. CLOSING IN SATIN. APPLICATION OF A HEART IN WOOD WITH CUTTING IMAGE REPRESENTING SAN PIO. NECKLACE ROPE NATURAL COLOR. 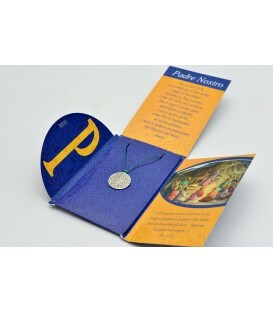 CMEDAGLIA ROUND METAL SILVER WITH CUTTING ON BOTH SIDES OF PRAYER "OUR FATHER". PACKED IN A CARDBOARD ELEGANT FOLDING PICTURE OF SAN PIO, QUOTE OF THE GOSPEL OF PRAYER OUR FATHER AND PRAYER TO SAN PIO. KEY PLASTIC. 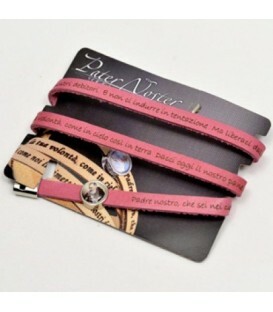 CHARM METAL HEART SHAPED PRINTED IN FOUR OF RESINATED 'IMAGE REPRESENTING PADRE PIO. BRACELET THE TREE OF LIFE. FORMED BY FOUR WIRE TWO IN LEATHER AND TWO TWISTED ROPE. MEDALS METAL REPRESENTATIVES OF THE TREE OF LIFE AND TWO ANGELS. PACKED ON THICK WITH SAN PIO IMAGE AND BACK QUOTE FROM THE BOOK OF GENESIS AND PRAYER TO SAN PIO. BRACELET PEARLS. 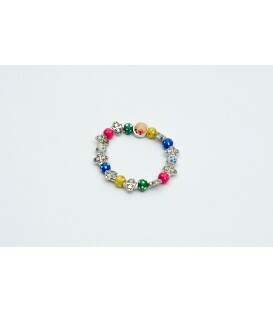 FORMED BY ROUND SMOOTH BEANS MULTICOLOR spaced PLATES WITH CRYSTAL. BIND STRETCH. MEDAL PENDANT OVAL WITH PICTURE PRINTED IN FOUR RESINATED REPRESENTING SAN PIO AND CROSS PENDANT METAL. BRACELET FOR CHILDREN IN WOOD DRY CURED, BIND ELASTICA. FORMED BY ROUND GRAIN PAINTED FROM ALTERNATE HAND WORKED METAL PLATES IN A FLOWER FORM. MEDAL CENTRAL TONDACON PRINTED IMAGE IN FOUR RESINATED REPRESENTING SAN PIO. BRACELET PEARLS EFFECT cracked. FORMED BY ROUND SMOOTH BEANS MULTICOLOR. BIND STRETCH. MEDAL ROUND WITH CENTRAL IMAGE PRINTED IN FOUR RESINATED REPRESENTING SAN PIO. 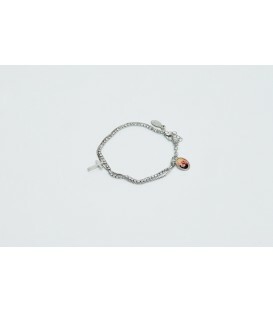 BRACELET IN METAL DOUBLE WIRE WITH CRYSTAL. CLOSURE WITH HOOK. MEDAL PENDANT OVAL WITH PICTURE PRINTED IN FOUR RESINATED REPRESENTING SAN PIO AND CROSS PENDANT METAL. 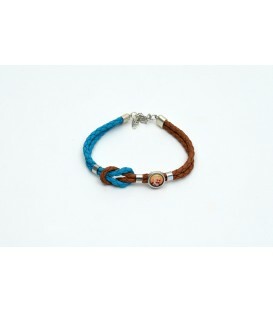 BRACELET IN LEATHER TWO-TONE WITH KNOT FISHERMEN'S CLOSURE WITH HOOK IN METAL. MEDAL ROUND WITH PICTURE PRINTED IN FOUR RESINATED REPRESENTING SAN PIO. BRACELET PLASTIC. FORMAT OF BEANS ROUND BEADS MADE OF SYNTHETIC ALTERNATE FROM BEANS IN METAL. BIND STRETCH. MEDAL PENDANT OVAL WITH PICTURE PRINTED IN FOUR RESINATED REPRESENTING SAN PIO AND CROSS PENDANT METAL. 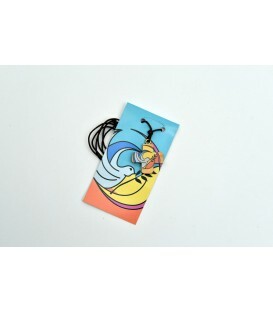 Bracelet for children in resin. Formed by round smooth grains with elastic fastening. Tau in olive wood with inscription: "San Pio". Leather wearable bracelet three laps. Engraving of the prayer "our father" along the whole extension of the bracelet. Metal closure. Round Medal with printed image in CMYK colored resin depicting Padre Pio.